This Prairie oasis truly has it all: Culture and history, family activities, golf, great shopping, and plenty of great restaurants just footsteps away from our Medicine Hat accommodations. We’re one of the best hotels in Medicine Hat for visitors who want to take a bite of Canada's rich history. From cultural artifacts to beautiful riverside parks, guests can easily access many of the top Medicine Hat tourism attractions. 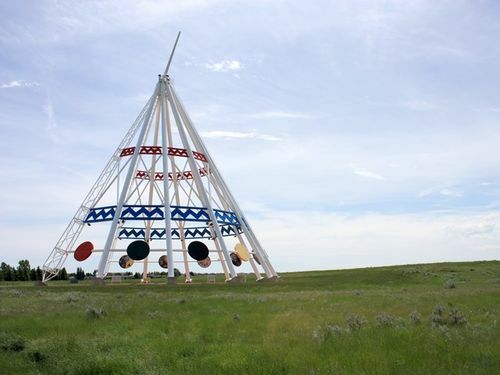 Constructed during the '88 Calgary Winter Olympics, the world's tallest tepee now stands as a Medicine Hat tourism landmark, paying tribute to Canada's indigenous people. 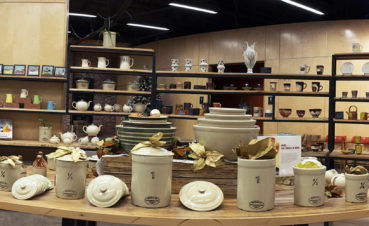 Admire and shop for pottery at this popular Medicine Hat tourism attraction in the Historic Clay District. Visit the museum housed in a converted century-old factory. The largest shopping centre in southwest Alberta has everything from boutique shops to national department stores, and it's just across the street from the Comfort Inn Medicine Hat. 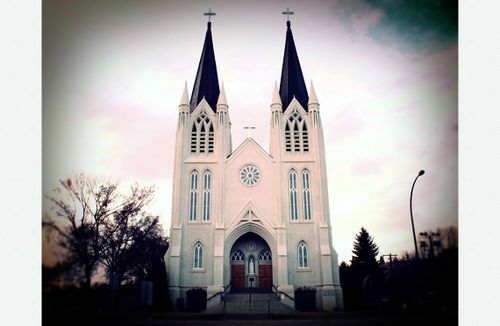 Since its construction in 1912, St. Pat's Church has become Medicine Hat's most prominent landmark. With a 170-foot gothic tower, it is a fine example of Gothic Revival architecture in North America. 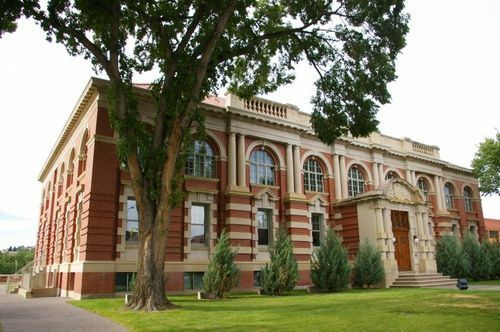 The Medicine Hat Courthouse is an ornate two-storey building, distinguished by its Beaux-Arts Classicist elements and brickwork. It was constructed between 1919 and 1920. Now an office for the Canadian Pacific Railway, the train station no longer serves passengers. However, its iconic historical structure and red brickwork is still a prominent sight in Medicine Hat's downtown area. 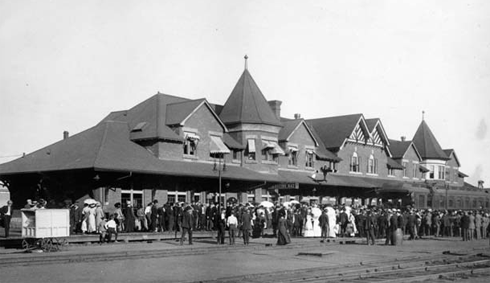 It has been recognized as a Heritage Railway Station by the Canadian government. Some of the most beautiful—and free—places to explore the coulee landscape are in the riverside parks. The 300-acre Police Point Park is every nature lover’s dream with dozens of trails, including shale paths along the river, and learning opportunities at its Interpretive Centre. On the other side of the South Saskatchewan River, you’ll find Strathcona Island Park, a water playground perfect for cooling off the little ones. After meandering the shaded trails in these parks, entertainment for the young continues with the Windmill Garden Centre & Butterfly House, home to exotic butterflies, birds, fish & turtles. If you want to learn a little more about how this city came to be, visit the Medicine Hat Tourism Centre and stand under the World’s Tallest Teepee which was designed for the 1988 Winter Olympics in Calgary. For a living museum experience, visit the 150- acre Medicine Hat Clay Industries National Historic District and learn how the Medicine Hat's clay-products industry came about through collections, exhibits, interpretation, guided tours, and educational and artistic programs. Most notable are the Medalta Potteries and Hycroft China factory complexes. Enjoy a relaxing round of golf in the breathtaking river valley landscape at Medicine Hat Golf & Country Club, Cottonwood Coulee Golf Course or the links-style course at Desert Blume. Or if engines are more your thing, the Medicine Hat Drag Racing Association ¼ length track is located just off the Trans Canada Hwy and is home to the NHRA National Open. The Tourism Medicine Hat website introduces you to all the best things to do season to season so you can make the most of your stay. Or, stop by in person for recommendations! At Cooper Coulee Casino, we pride ourselves in creating the complete casino experience. At Copper Coulee you will find the the latest gaming technology, old favourites, good food and drinks and an exciting atmosphere. A short drive from your Comfort Inn and Suites, this is perfect place for a family picnic or riverside stroll. Kids will love the locomotives and World War II tank on display. Book your Medicine Hat accommodations at the end of July for southeast Alberta's oldest rodeo and exhibition, or catch other events held on the grounds throughout the year. Get cultured at this centre for the arts located a short distance from our choice hotel in Medicine Hat. Enjoy music, dance, theatre, exhibitions, literary readings and more. Bring burgers to barbecue and a bathing suit for the kids to splash in the water park and walk the trails along the South Saskatchewan River near your hotel, Comfort Inn & Suites. Go for a stroll and spot birds and wildlife or join in on interpretive programs at this nature reserve, located just a 9.5-kilometre drive from the Comfort Inn Medicine Hat. Enjoy leisure amenities, including an Olympic-size ice rink, running track, fitness and aquatic centre with wave pool, just a 12-minute drive from your Medicine Hat hotel suite. Spend a day at the lake. A short drive from places to stay in Medicine Hat, laze on the beach, fish for trout, walk along trails, and enjoy a picnic. Offering authentic Indian cuisine, The Mango Tree is worth the 10-minute drive from the Comfort Inn & Suites in Medicine Hat, Alberta. Take a daytrip from your Medicine Hat hotel to enjoy all-season activities -hiking, fishing, Nordic skiing, snowshoeing- and visit the National Heritage Site of Fort Walsh. Only a nine-minute drive from Medicine Hat Comfort Inn and Suites, glide or play a rousing game of shinny at this indoor rink, offering public and family skate times. Immerse yourself in a good book or magazine or take in a special event or movie at this public library, only a 10-minute drive away from the Comfort Inn and Suites. Explore the beautiful grounds and enjoy on-campus cultural art and theatre events at this Alberta learning institute, located close to Medicine Hat hotels. Explore John's Butterfly House at the Windmill Garden Centre, named after founding member John Van Dam, and learn about a variety of exotic butterflies and their life cycle. Established in 2008, Thai Orchid Room is a dining destination to delight your senses. Offering a full lunch menu, dinner, take out, and full service bar you're sure to enjoy their award-winning cuisine. Local is like your living room—but with people serving you food and beer. Sit back and relax in Med Hat's neighbourhood meeting spot, featuring fantastic craft beer, local eats, and rotating specials. Located just minutes up the Trans Canada from our hotel in Medicine Hat, this charming café serves up fresh-made soups, paninis, pizzas and premium coffees. We're one of the hotels near the Medicine Hat Mall, and Earls Kitchen + Bar is right in the same neighbourhood. Expect a diverse menu that's full of flavour. Located right next to our Medicine Hat accommodations, you can tuck into a wholesome meal any time you like at Perkins Restaurant & Bakery. Donuts and ice cream anyone? Tim Hortons and Cold Stone Creamery are located just paces from the Comfort Inn & Suites Medicine Hat. 11 herbs and spices and a whole lot of chicken. For a quick, tasty meal, KFC is within walking distance of the Comfort Inn Medicine Hat. Guests staying at hotels in Medicine Hat, Alberta sometimes forget to pack daily essentials. If that sounds familiar, you'll be happy to know Walmart is five minutes away. People often forget to pack kibble for their pooches when travelling to pet friendly hotels? For that and other travel essentials, Superstore is just around the corner. Located in the Medicine Hat Mall, Ben Moss is a Canadian owned and operated jeweller offering a dazzling range of rings, watches and other jewelry. People staying at hotels in Medicine Hat, Canada often need knick-knacks, snacks and other travel necessities. The Dollar Tree has all of that, and then some. Guests staying at pet friendly hotels in Medicine Hat sometimes forget to pack certain pet essentials. Whether you need food, a leash or a toy, PetSmart is just a short drive away. See who's on first by catching a home game by this Western Major Baseball League team. Games are played from June to mid-August at Athletic Park. Wear your orange and cheer on the Tigers! Western Hockey League home games are played at the Canalta Centre, located 12-kilometres north of our Comfort Inn location. Medicine Hat's only twin arena is open for adult and public skating as well as drop-in shinny hockey. Call the skating hotline at 403-502-8570 for scheduling. Glide on over to this arena, which features a 185-by-85-ft. ice surface for free public, adult and family skating. Call the skating hotline at 403-502-8570 for scheduling. Perfect for families, groups and corporate events, throw a rock at this 8-sheet rink as part of your stay at the Comfort Inn and Suites. Features a full-service lounge. Alberta's only sanctioned National Hot Rod Association track, this ¼ mile track hosts a variety of events from jet & alcohol cars, to bracket racing and the NHRA National Open which attracts 300 cars from all over North America. Play amongst the cottonwoods at this beautiful and challenging 18-hole executive style course. Enjoy golf stays in Medicine Hat with our Executive Golf Package. First-time and experienced golfers will love this 18-hole course, with a par 3 and scenic views at every hole. Features an on-course beverage service and restaurant/patio. Up your game on this 72-par championship course located on the cliffs of the South Saskatchewan River. Stay and play as part of our hotels in Medicine Hat golf package. Drive along tree-line fairways and putt on the immaculate greens at this golf course. Stay a night and golf all day with our Champion Medicine Hat hotel golf package. Starting in 1961, the Medicine Hat Musical Theatre filled an important void in the world of Medicine Hat. From romance to drama, this theatre has a production for you! This theatre company is known to push the boundaries with award-winning contemporary and classic productions from Forever Plaid to Rocky Horror. Enjoy a night out at the movies with our Medicine Hat Comfort Inn family package. Includes a $30 Cineplex gift card for the Galaxy Cinemas in the Medicine Hat Mall. Watch first-run and art house films at this oldest operational movie theatre in Canada. Regular movie nights are every Friday, Saturday, Sunday and Wednesday at 7:30 p.m.
Medicine Hat is home to three Shell gas stations, serving travellers along the Trans Canada Highway as well as South Ridge Drive SE and Dunmore and Southview East SE. Take a rest stop at this Esso TransCanada Truck Stop in Redcliff, just west of your choice hotel in Medicine Hat. Open 24 hours with a restaurant and convenience store. Earn Petro Points at this gas station on Redcliff Drive SW, off the Trans Canada Highway. Open 7 days a week from 6 a.m. to 11 p.m. Features a JavaStop and CIBC ATM. Located at 642 Kingsway Ave. SE in downtown Medicine Hat, this gas station features a touchless car wash and four wand-wash car bays as well as a convenience store and ATM. One of the first retailers in Canada to offer electric car charging stations at all its locations, including at 64 Carry Dr. SE, Medicine Hat. Open 7 days a week. This fast-food chain has made-to-order burgers, fries & hot dogs, plus free peanuts while you wait! Canada's original burger restaurant. Serving great-tasting burgers, handmade onion rings, and frosted mugs of famous A&W Root Beer since 1956. This popular American fast food company was founded in 1940 by Richard and Maurice McDonald. The first time a McDonald's franchise used the Golden Arches logo was in 1953 at a location in Phoenix, Arizona. New York Fries is a Canadian quick service restaurant that mainly serves French fries and hot dogs. They also serve poutine! Whether you’re familiar with Indian cuisine or a newcomer to this style of cooking, Spice Hut’s six family-owned locations are sure to provide a dining experience you won’t soon forget. Our menu offers the gamut of made-from-scratch East Indian cuisine. The Beefeater Steak House is a family run business that has proudly served juicy prime rib and the finest cuts of steak to our hungry customers in Medicine Hat for over 38 years. Argos Restaurant is a locally owned and operated business which has been serving the community of medicine Hat for the past 13 years. Tsuki Japanese Restaurant is well known for its superior tasting sushi dishes. They also offer gluten-free and vegetarian choices. The Medicine Hat Brewing Company began serving old fashioned lager, ale, and stout in 1912. Since then, they've continued expanding with timeless craft beers. Stop by for a drink and great eats in their new kitchen. Inspired by the stories of Rudyard Kipling's travels across Canada, this brewery makes awesome craft brews—and offers behind-the-scenes tours! Sushi & Thai take your taste buds on a wild adventure with our Japanese and Thai cuisines. Feast on the Breaded Scallops, the Chicken Udon Stir Fried with Soup, and the Mango Chicken! Open since October 2003, Ralph’s Texas Bar & Steak House of 3 different experiences: A sportsbar with excellent food and drink specials available throughout the week; a steakhouse with a separate kitchen serving only Sterling Silver, local, hand cut steaks; a nightclub hosting live bands on Ralph’s stage and DJ music to keep you partying all night long. The Cheesecake Cafe is a full-service, casual restaurant with an extensive, moderately priced menu, in-house bakery and full bar. Long-running, family-friendly steakhouse chain known for its ribs, onion loaf & Romarita drinks. A tasty convenient dining option for friends & family, Moxie’s is located on bustling Dunmore Road, just a short drive from the Trans-Canada Highway. Come check out our diverse and newly created meal selections by Executive Chef Brandon Thordarson. This is a family friendly, all you can eat, casual buffet restaurant that everyone can enjoy!